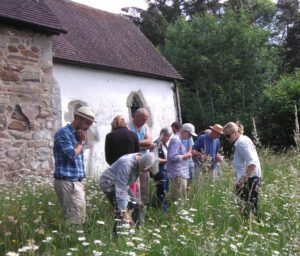 The Beautiful Burial Ground project aims to inspire, engage and support interest groups, communities and individuals to learn about, research and survey the biodiversity and heritage of their local burial grounds. Surveying a burial ground in your area. Sharing your burial ground records. Hosting a training event in a burial ground you manage. Help us run a training event if you have expertise. We have key groups within our communities that we would like to work with to inspire the use of burial grounds as places to enjoy and interact with biodiversity and social heritage. We are particularly interested in working with organisations who work with people with mental health issues, physical disabilities and mobility issues and families. “When someone says ‘come on a nature walk’, you don’t expect to be taken to a cemetery. Our two hours in Longden Cemetery in Shrewsbury proved to be an exciting way to spend a few hours. Our guides, Mark and Jenny were so informative. Within a few yards, we had found wild flowers, a spectacular fungus, a parasitic wasp, which gave everyone the shivers, an ancient type of apple tree and enough creepy crawlies to fill a jam jar. If you run such a group or are a member of a group and would like to know more please get in touch with George george@cfga.org.uk or phone 01588 673041.